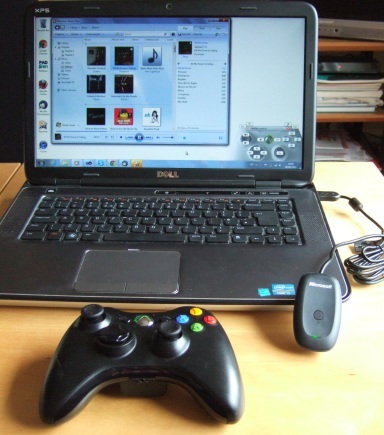 You can use Keysticks to control the music on your PC or laptop with a wireless Xbox 360 controller. It means that you can launch your media player, skip tracks or change the volume without using the keyboard or mouse. Try our media controls shown below and see what you think. They're included with the latest version of Keysticks, so you just need to install the software and load the media controls profile. The wireless Xbox 360 controller communicates with your PC or laptop via a Wireless Gaming Receiver which is a small device that plugs into a USB port. If you don't already have one, see the Download page for more information. 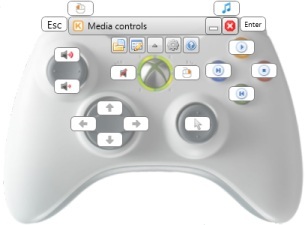 Keysticks then maps the inputs from the controller to the hotkeys for your media player. So pressing X is equivalent to pressing the "Next track" key, pressing Y is like pressing "Play/pause", and so on. Once you're used to Keysticks controls, you might like to try connecting your computer to your TV so you can use a wireless controller to browse the Web on your TV.